NBC 5's Jeff Smith wanted to start his live report on low lake levels with some action, but ended up stuck up to his knees in mud. Smith was planning to hop from a marina dock to the ground below, on what was once the lake bottom, but his legs sunk immediately into the mud. 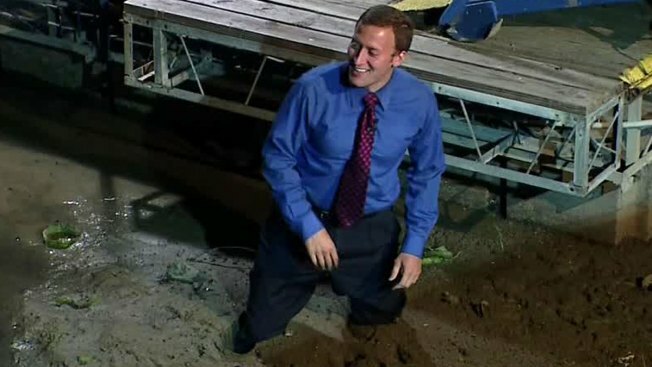 Following some laughter from his photographer, Kevin Williams, Smith decided to stay in the mud -- at least for the next live report. After concluding that live report, Williams came to Smith's rescue, pulling him free from the grip of the mud. Other than suffering from embarrassment and continuous laughter from the newsroom, Smith, ever the good sport (see video), was uninjured.